I have decided I’m going to start blogging my random feminist thoughts here. I have a lot of them all day every day but I’ve been finding it hard to do regular posts about feminism because I tend to put too much thought in them which means I often don’t get around to posting them or I think it’s not interesting/engaging enough. So instead I will post smaller “femmo-bites” about something I happen to be thinking about right now. The fact is, a lot of men do things like this. Not all, not even most, but a lot. There are also a lot of men who mightn’t actually do this sort of thing themselves but think about doing it or don’t see why there’ such a fuss about the men who do do it. The reason for this is because many men have it deeply ingrained in them that women are objects rather than people. They feel like they, as men, have the right to touch these objects that they find desirable. For a long time, the vast majority of women put up with it because it was deeply ingrained in us too that this was how it was and we had to accept it. It’s only been in very recent history that women have found themselves able to stand up and say NO, that is NOT appropriate, and even more recently that laws have be adjusted to reflect this. Feminism is still crucial these days, even though at a glance it might seem like women and men are pretty much equal. The wage gap and the glass ceiling both still exist, for example. But very importantly, too many men are still finding themselves unable to view women as people rather than objects and so they touch, abuse, harm and kill them in abundance. Sometimes women find themselves unable to yell at a man for touching her inappropriately because there is the very real risk that he will harm her for daring to stand up to him. The woman in this video found herself in a position where she could safely confront the man trying to touch her without her consent and did so. But if she had been in a different scenario it possibly would have been safer for her to be quiet, ignore him and leave the situation as quickly as possible. That is not equality between genders, that we cannot stop something horrible happening to us because we might get hurt or killed for saying no. We have a very long way to go, because there are still too many men who are like this and when women try to talk about it, a bunch of other men get upset because they feel unfairly targeted despite the fact that wasn’t actually the case. 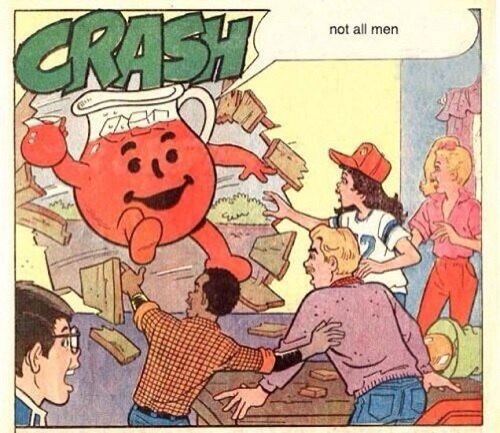 That harms these conversations because it means women have to then double back and clarify that they didn’t mean ALL men at all and the original conversation has been derailed and brought back to focus on men. That is counter productive. So PLEASE understand, when women are talking about this sort of thing, we do NOT mean ALL men do these things. We are referring to those men that do. If you don’t do these things, GREAT. Keep not doing those things and maybe have a go at listening to what women are saying instead of wondering if we’re indirectly referring you and bringing the conversation back to your hurt feelings!